There are many accounts written of forays by the various Plains Indian Tribes beyond what they considered their "home territory". This painting depicts a small group of Blackfeet in what is now Jackson Hole, near an area called Blacktail Ponds. Journeys for war, retaliation, hunting, or horse stealing were made without regard to the time of year. The time here is late winter. The stick in the water was left by a trapper - used when setting traps for beaver. 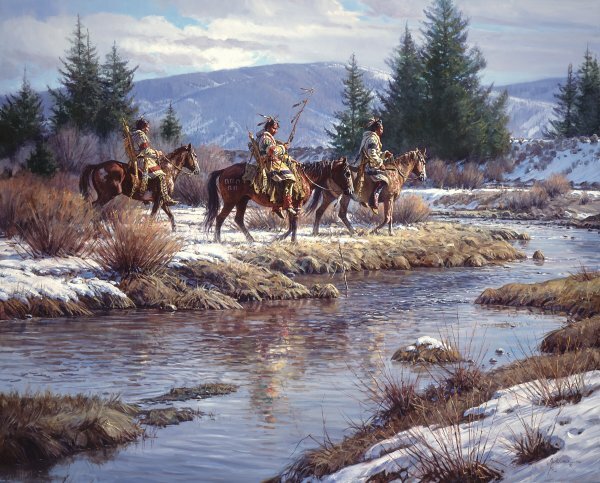 Martin Grelle's painting "Blackfeet at Blacktail Ponds" was highly sought after and sold at the Coeur d'Alene Auction in 2006. The painting is magnificent and measures a full 48" x 60", which is the size of the Grande Edition Giclee on Canvas.